Japan, Korea and Chinese Taipei are among the top 10. 12 other BFA countries are listed: China, Pakistan, Hong Kong, Indonesia, Philippines, Sri Lanka, Thailand, Iran, India, Nepal, Singapore and Iraq. LAUSANNE, Switzerland, Sept. 27 -- The World Baseball Softball Confederation (WBSC) today unveiled the newly updated WBSC Baseball World Rankings, which weigh a country's National Team performance -- from U-12 to Professional -- in official WBSC-sanctioned international competitions over a four-year period (2015-2018). Underscoring baseball's growing status as a major global team sport, representatives from the Americas, Asia, Europe and Oceania are all present within the Top 10 of the WBSC Baseball World Rankings. "These rankings show that baseball is being played at elite levels all around the world, including key targets like Europe and Oceania, with Africa's development on the rise as well," said WBSC President Riccardo Fraccari. "This ongoing global growth will boost the case and excitement for baseball and softball's long-term Olympic future beyond Tokyo 2020, looking toward Paris 2024 and Los Angeles 2028." 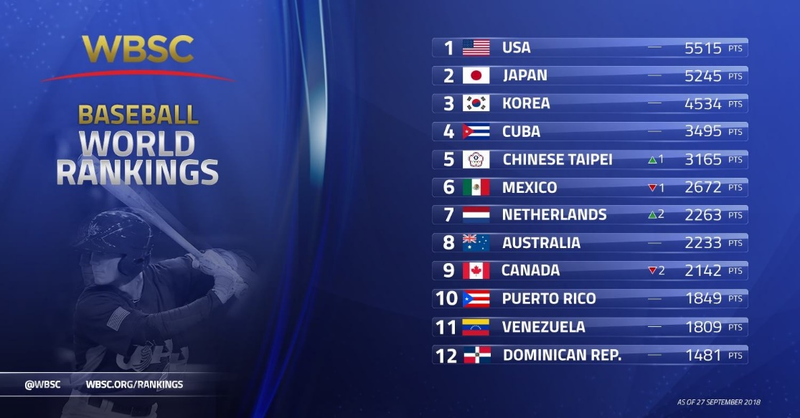 The United States -- winner of the U-15 Baseball World Cup in David, Panama, and the U-12 Pan-Am Championship in Aguascalientes, Mexico -- remains atop the rankings, a position the Americas nation has held since February. Japan, Korea and Cuba all maintained their previous positions within the Top 10, but No. 2 Japan has narrowed No. 1 USA's lead (from 416 to 270 points) while moving further ahead of No. 3 Korea and No. 4 Cuba. Japan claimed the silver medal at the Asian Games in Jakarta, Indonesia, earned bronze at the U-12 Asia Championship in Taipei, Taiwan, and finished fourth at the U-15 Baseball World Cup. Korea won the Asian Games and the U-18 Asia Championship, and finished in 2nd Place at the U-12 Asia Championship, but did not qualify for or earn ranking points from the U-15 Baseball World Cup. To date, Chinese Taipei national teams have earned the most points in 2018, elevating the nation's ranking from sixth to fifth in the world, exchanging places with Mexico. Chinese Taipei won the U-12 Asian Championship, claimed 2nd Place at the U-18 Asia Championship in Miyazaki, Japan, and earned the bronze medal at both the U-15 Baseball World Cup and Asian Games. Europe's top-ranked baseball nation, No. 7 Netherlands, winner of the inaugural European Super 6, advanced two places in the rankings, bypassing the now No. 8 Australia and idle/No. 9 Canada. Netherlands also finished in 8th Place at the U-15 Baseball World Cup, ahead of 9th Place Australia. Puerto Rico -- baseball gold medalists at the Central American and Caribbean Games in Barranquilla, Colombia -- continues as the 10th ranked baseball nation in the world. No. 11 Venezuela and No. 12 Dominican Republic remain at the critical cut-off point for qualifying into next year's biggest and most exciting international competition, the II WBSC Premier12®, which is a Tokyo 2020 Olympic Games Qualifier. Baseball's Top 12 ranked nations at the end of 2018 will compete in the global flagship Premier12, with the upcoming U-23 Baseball World Cup in Barranquilla and Monteria, Colombia, to serve as the last major opportunity to advance in the rankings.